TOKYO (AP) — Sheikh Ahmad al Fahad al Sabah, who has stepped away temporarily from the presidency of an Olympic umbrella group to fight a criminal court case in Switzerland, was praised by IOC President Thomas Bach on Thursday. “We have said, first of all, that we respect the decision he took under his own will and we recognize that this decision, his decision, was taken in the interests of all of us,” Bach told 1,400 delegates of the Association of National Olympic Committees. The Kuwaiti sheikh last week also suspended himself from his 26-year membership in the International Olympic Committee in order to fight the corruption case. ANOC senior vice president Robin Mitchell will serve as the acting president. Mitchell said he had no idea how long that would be for. 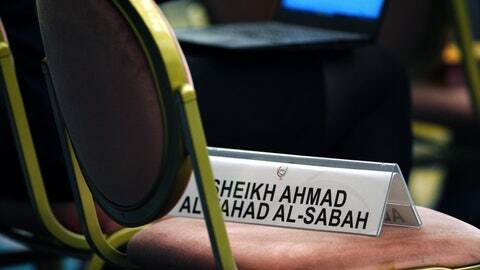 Sheikh Ahmad is accused by Geneva public prosecutors of forgery in an alleged faked arbitration case involving four others. “We hope we can see him back here very soon after his case is solved,” Bach told delegates, who applauded warmly. Many credit Sheikh Ahmad with swinging votes to get Bach elected in 2013. The IOC has been hit with embarrassing corruption cases. Sheikh Ahmad is the third IOC member recently to be suspended — or self-suspended. A fourth, honorary member Carlos Nuzman who headed the 2016 Olympics, is also suspended.